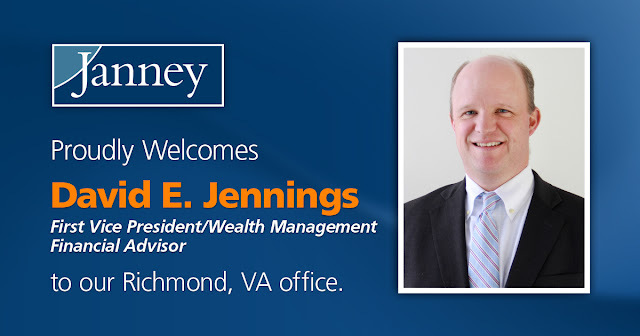 PHILADELPHIA, PA – MARCH 29, 2017– Janney Montgomery Scott LLC (“Janney”), a leading full-service wealth management, financial services and investment banking firm headquartered in Philadelphia, PA, today announced that David E. Jennings, First Vice President/Wealth Management, has joined Janney’s Richmond, VA branch office. Joining Jennings from Merrill Lynch is Kristina Spurlock, Private Client Assistant. Jennings, a 20-year veteran who held various leadership roles throughout his tenure at Merrill Lynch, manages over $135 million in client assets. He graduated from Washington & Lee University, and is active in a number of civic and charitable organizations, volunteering with Ronald McDonald House and Bon Secours Hospital, as a coach of the St. Michael’s middle school golf team and Richmond Little League, and as Alumni Liaison on the Washington & Lee Regional Alumni Board. Janney’s Richmond, VA branch office is located at 1021 E. Cary Street, Suite 100, Richmond, VA 23219.